I expect more and more people will fall in love with e-book reading. I spend a lot of time on e-book reader forums, and lots of people already love their e-book readers. Love. Most of them say they will never go back to printed books, and that they are reading more than ever before. Not to mention that the last of the paper book converts will die off and the newer generations will consume everything electronically. 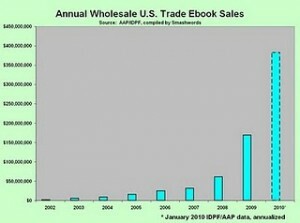 So, it comes as no surprise to me that the e-book market has tripled in 2009, after doubling in 2008. Or that it is on pace to double or triple again this year. Or that Amazon, the world’s largest bookseller, sold more e-books than printed books last Christmas. E-books made up 3.31% of all book sales in 2009, and that number will likely increase to 6-10% this year. By 2015 or 2020, what will that percentage look like? 25%? 50%? 75%? What does this mean for printed books, and the future of publishing? I’ll get more into that in my next post. But I fully expect the acceleration of e-book sales to continue. The reading experience is just too good, and they just make too much sense not to.